For teeth that have been damaged, have suffered from decay, or are significantly flawed in appearance, dental crowns offer an all-inclusive treatment. Dental crowns can restore lost or damaged tooth material, all while improving the function and aesthetics of the tooth. Dental crowns come in a variety of materials, all of which should withstand the usual wear and tear that the teeth are exposed to, offering patients a dental solution that can be expected to last for many years. However, there are factors that can cause dental crowns to become damaged. Cosmetic dentist Byron W. Wall offers repair and treatment to his Albuquerque patients with damaged dental crowns. By replacing damaged crowns, Dr. Wall ensures that the function, strength, cosmetics, and comfort of his patient’s teeth are restored. Tooth decay or gum disease: Dental crowns are fabrications that cannot become decayed. However, the tooth within the dental crown, untreated teeth around the dental crown, and the surrounding gums are all vulnerable to decay. Patients need to be aware that, even with a crown in place, the teeth must continue to be brushed, flossed, and cared for by a dental professional. If the teeth or gums surrounding a dental crown become decayed or infected, the dental crown may lose stability or require replacement. Injury: Injuries to the mouth are a common cause of dental crown damage. 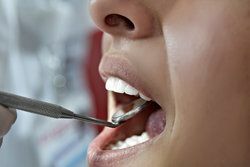 Just as the teeth can be chipped, cracked, or fractured by a traumatic blow to the face or mouth, so can a dental crown. It is very important for patients to use dental mouth guards when participating in sports or activities that increase the risk of injury. Excessive force/friction: While dental crowns are strong enough to withstand the usual wear and tear of the teeth, putting excessive force or friction on crowns can lead to premature damage or wearing down of the crowns. Biting on hard food or candies, nail biting, teeth grinding, and clenching should all be avoided in order to preserve the strength of dental crowns. Time: Even with the best care, eventually dental crowns will wear down. Although dental crowns may last for 10 to 15 years, patients should anticipate that they will need replacement at some point. When a dental crown has been damaged, it is vital to address the problem in order to protect the tooth and prevent problems such as decay and root canal infection. In some cases Dr. Wall may be able to repair a damaged crown. However, in most cases, we will remove the damaged crown and replace it with a new restoration that can protect and restore the tooth for years to come. As with all dental health concerns, it is best to address a damaged dental crown right away in order to avoid further complications. If you have a dental crown that has been damaged or simply become worn down, contact us at your earliest convenience to learn about the dental solutions offered by Dr. Byron W. Wall. We look forward to hearing from you!